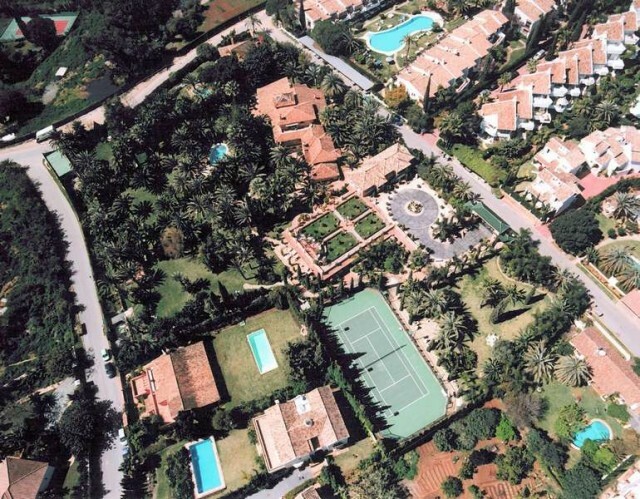 A fabulous large villa on a plot of almost 10,300 m2 with 150 mature palms trees and mature garden; outdoor swimming pool with bar/chiringuito and tennis court, situated in one of the best areas of Marbella, just 5 minutes from Marbella centre. The main house comprises: ground level: ample porch and terrace; entrance hall with guest cloakroom; living area with 3 different ambiences: winter, formal and summer; dining room; fully-fitted farmhouse-style kitchen with pantry; guest suite with independent access comprising sitting room, bedroom and shower room and 2 additional guest suites. Upper level: spacious bedroom with en-suite facilities, sitting area and private terrace. Lower ground level: exceptional wine cellar with bar; TV room; kitchen with asador-type oven; shower room. Guest house with independent car access and circular drive, comprising, on ground level: very large indoor pool; jacuzzi; sauna; steam room; showers; bar and cinema screen; sunny terrace; large split level sitting room; bedroom with dressing area and bathroom with shower and jacuzzi; multi car garage with laundry room and storage cupboards. Upper level: living/dining room; kitchen; 2 adjoining bedroom suites, each with independent access. Staff house with 2 bedrooms. 2 water tanks. A magnificent property with lots of potential , enjoying sea and mountain views and absolute privacy.